Here methane emissions, computed from four potential sources (i. e. 1) groundwater degassing as a result of groundwater abstraction for domestic and municipal uses; 2) groundwater discharge along rivers; 3) migration to the surface by (macro- and micro-) diffuse seepage; 4) degassing of hydraulic fracturing fluids during first phases of drilling. ), are reported for an area of ca. 16,500 km2 of the St. Lawrence Lowlands, Quebec (Canada), where Utica shales are targeted by the petroleum industry. This study shows that different methane emission sources need to be considered in environmental assessments of methane exploitation projects to better understand their impacts. 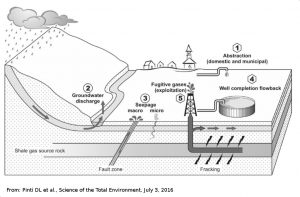 CH 4 baselines in groundwater used for refining emissions to the atmosphere. Methane fluxes from Quebec Utica shale prospection area evaluated. 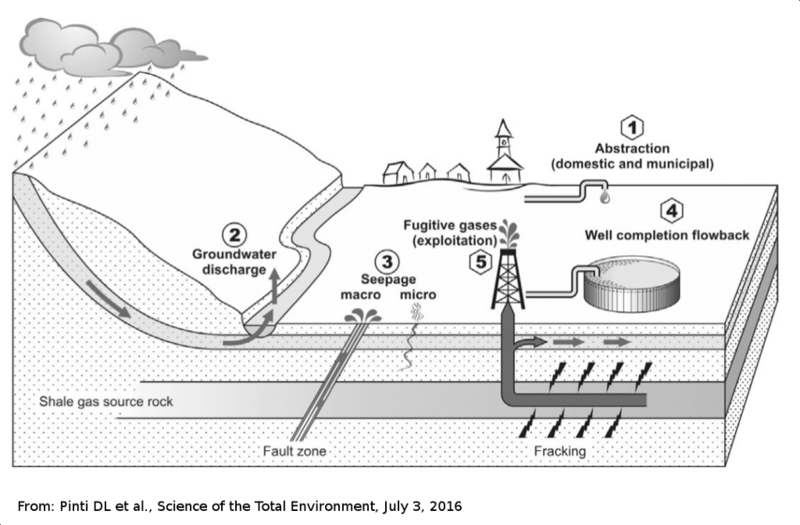 CH 4 emissions from human abstraction are 300% those of all United Kingdom aquifers. Groundwater discharge is the main CH 4 emission natural source. CH 4 emitted from groundwater could be higher than that from fracking, yearly.